Use the Survey Integration feature to help monitor the level of service and requester satisfaction for the work your team provides. 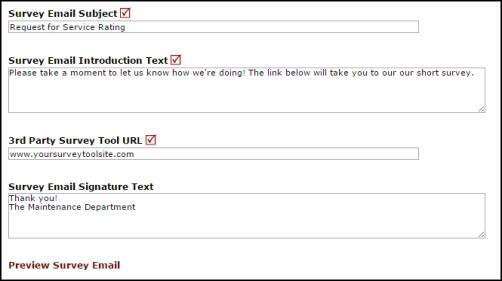 Administrators can schedule a survey email to be sent to requesters when their work orders have been marked Complete or Closed. Create a survey using a free 3rd party survey solution, such as Survey Monkey or Survey Gizmo, and include the survey link in an automated email to your requesters at your chosen frequency. Once the survey is active and has been sent out to requesters, you can click on the Survey Email Log to view the survey emails that have been sent. 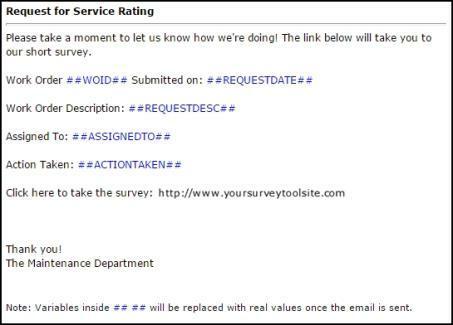 *Note: Survey results can only be accessed through your 3rd party survey tool and not directly through Work Order.